When you pick up a box of Ashton Classic cigars, you are greeted with the Ashton logo, a simple logo, and the words ‘Ashton; Imported, Made By Hand’. Don’t let this fool you, though, these cigars are complex, even though the band and box may be as simple as can be. Opening the box, you’ll be greeted with the sight of rows of very light cigars. Each band bears the same logo and words as the box does, and the smell will be one of creamy and slightly nutty tobacco. 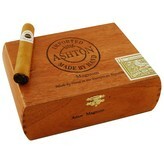 These cigars are made for Ashton by Arturo Fuente, one of the biggest names in cigars, and they are made in the Dominican Republic. The cigars are made with tobacco harvested in the Dominican Republic, which will then be aged for three to four years to mellow it. That tobacco will then be trimmed and wrapped in a Connecticut Shade wrapper, which will impart the creamy flavor and the light tan look to the cigar that is so characteristic of the Ashton classic line. When you light the cigar, you are aware of a creaminess, a hint of pepper, and some wooden tones. The cigar finishes mildly, and leaves a faint and lingering taste of pepper on the tongue, making it a very complex and yet approachable cigar that can be enjoyed by the aficionado or the neophyte alike. An Ashton Classic Magnum box of 25 cigars is a real treat, and allows you to have a store of your very own for your uses, whatever they may be.